As a busy mother-of-four, Kenza Drider never paid much attention to what she wore during the day. The 32-year-old housewife was far too busy getting the kids to school, shopping, cooking and cleaning. Last week, however, the style of robe which Kenza has worn for more than a decade sparked a crisis in her home country of France. The niqab, which reveals only her dark brown eyes, is now illegal – in the wake of a nationwide “burka ban” which came into force this week. Devout Muslim Kenza is so angry at the new law she has set herself up as a “hidden face” of the protest against it. She has been arrested twice, threatened in the street and even received death threats from racists. Yet nothing will stop her standing up for what she believes in – the right to wear her full veil in public. “The law makes France look stupid around the world,” she says defiantly. “I never thought we’d reach a day when the country where I was born and which I love would end up imposing a law like this. Pointing to countries such as Britain with large Muslim populations but no ban, Kenza says: “They don’t want one and they don’t need one. “France is meant to be the land of liberty, equality and fraternity yet it has adopted this ridiculous law. Before the ban, Kenza enjoyed a normal life in the suburbs of the UNITEDJ medieval city of Avignon and she still lives on the St Jean estate with her husband Allal, a 40-year-old factory worker, and their four children. But, nothing is normal any more. 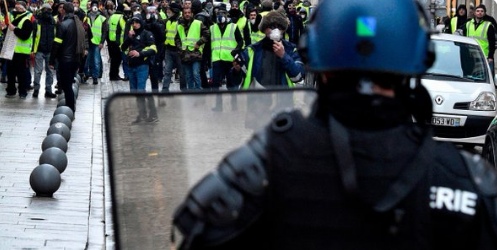 On Monday, the first day of the ban, Kenza travelled to Paris to take part in an illegal demonstration against it outside Notre Dame cathedral. She was arrested, taken to a police station and verbally cautioned. 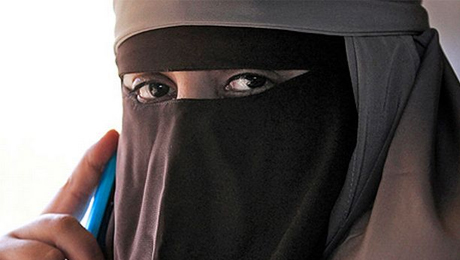 Under the law, women wearing the full veil in public face a fine of €150 (£132). If they repeat the offence they will be sent on a “citizenship course” to try to persuade them not to re-offend. But Kenza has no intention of ending her one-woman protest. “We have to show people exactly how we feel about this ban,” she says. “It’s no good just moaning about it – we have to do something. “Nothing will prevent me from going about my business in my full veil, just as I have for the past 12 years. “Nobody can stop me living the way I want. If a few women want to wear full veils, they should be allowed to do so. If Kenza keeps receiving penalty notices and refusing to pay them she may end up in prison. But it is a risk which she is prepared to take. Like many of the 2,000 or so women who wear the full veil in France, Kenza takes her religion very seriously. She wears her niqab whenever she goes out but takes it off when she is alone or with other women at home. Kenza, whose parents were from Morocco, laughs at the idea that she is being forced to wear the veil against her wishes. “Wearing the niqab was something I chose to do,” she says. “It was entirely my own decision and nothing to do with my husband or anybody else. “Religion has always been a big part of my life. I come from a family of practising Muslims but I never covered my face when I was young. Kenza says it was only when she started reading the Koran properly that she considered it appropriate to wear a full veil. “I didn’t even tell my husband what I intended to do,” she says. “I just put it on before a shopping trip and he was entirely happy. “He said, ‘OK, no problem – let’s go’. My husband is as gentle as a lamb about it. “It was just a normal thing to do. Now I always feel relaxed and happy in my veil. In fact, I’d feel naked without it. “I have young daughters but I’d never encourage them to wear veils, let alone force them, and nor would my husband. Kenza’s husband Allal joined in to rubbish suggestions that the veil encourages Muslim extremism. “If people think we are extremists then they have a very vivid imagination,” he says. “We are just ordinary people who want others to respect our religion. Kenza lays the blame for the ban firmly at the feet of French President Nicolas Sarkozy. She believes he wants to be seen to be “doing something” about France’s growing Muslim community ahead of next year’s presidential elections. “Ever since Sarkozy’s government turned the veil into a political issue I have been subjected to all kinds of insults and worse,” she says. “At one stage a man lunged at me with a knife. It was terrifying. “Racism and xenophobia have been a direct result of this ban, with Muslims being harassed because of it. “Our struggle is about fundamental human rights, including the right to wear what we want. “I’m determined to carry on with my life in my veil and I will fight for the right to do so.